Scottish & Newcastle | Rocket Steps. The art of communication. Try as we might we couldn’t cancel the guest house in Dunstable the previous night to make a bit of headway on the road North. The landlady and her massive dog – with a tongue like carwash roller – was adamant we must endure her hospitality, despite the fact that the lad on the desk looked us in the eye and admitted he didn’t know what he was doing. A long drive next morning was rewarded with the emotional sight of the Tyne’s many bridges, hello Newcastle, I miss you. My lass flies home from the states today, she left before the tour started and it’ll be another week or so before I see her, she send’s me messages using a combination of phone text, smart phone app and facebook. I have a new HTC phone and it’s driving me nuts. I cannot keep track. Hello Bron, I miss you. The Tyne Theatre itself is a beautiful venue, I’d seen Jonny Vegas here in 2002 and now poster’s for Sarah Millican adorn the wall, nice. They still make hand painted signs that hang outside the venue advertising the shows. I want to bring my own show here sooooo much. The tech’s are chatty, the very definition of ‘canny’. We share some ‘on the road’ stories, and later the show is very canny too, maybe the best yet. Some mates from way back come and watch, they loved it, I loved doing it, it’s all beautiful. Again it’s the old theatre’s that are the better ones, they feel both vast and intimate at the same time. I stay at my folks, my mum has made biscuits and also her own recipie bread. It’s late. i’m hungry. I watch doctor again. I must be tired and emotional. I’m so happy I could cry. I used to hate it up here. The Durham/Northumberland border is gorgeous country, but in my early twenties living outside Durham for a couple of years there was simply nothing to do. The venue is nice enough and easy to get to, but If anything it’s me thats a little off form. After the high’s of Newcastle, try as I might, I’m not feeling it tonight. There is a chatty lady in the house, as it turn’s out she is a ‘behavioral specialist’. Go figure. Charlie is staying in the Derwent valley hotel, which used to be owned by Rowan Atkinson apparently. It over looks the Derwent Valley (doh) and some amazing views, on the way back after the show I get a great photo of the sunset, thank you Consett and goodnight. Tarmac is bleeding out of my ears. It’s only as we drive into Glethrothes from Consett after five and a half hours that it dawns on me that I pressed ‘no’ to toll roads on the satnav, taking us a whole hour and a half longer to get to the venue by avoiding the fourth bridge and driving right round the not insubstantial coastline of Scotland. Fife, We have no business being anywhere near there. The venue is the Rothes hall and is capacious. 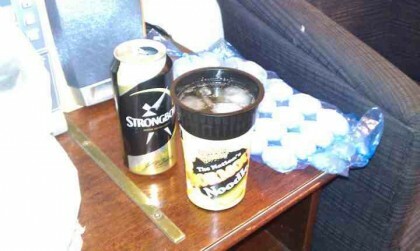 I still have my make-shift empty pot noodle tub drinking recepticle. It has already com in handy on several occasions. My missus made it back into the country without incident, a thought on my mind since the americans shot Cat Stevens in the teatowel. Today is full of win so far.